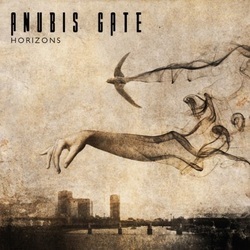 Danish prog power maestros Anubis Gate have gone through a bit of flux over the past few years with members coming and going and this has caused them to refocus and reboot a couple of times. This release sees a couple more new members join the ranks. The writing and production are not adversely affected however and we are greeted with some lush and majestic melodies and vocal arrangements that speak volumes. Though this album is very heavily focused on the melodic, there are some really good guitar riffs to be found here as well to give it a bit of punch when needed. The beginning of Revolution Come Undone is a good example as things do start to get a bit sleepy with Airways so it makes a perfect pick me up. This song is an excellent example of the exquisite song writing that the "Gatekeepers" can do as it is a perfect blend of crunchy power and really nice melodic hooks! As funny as it sounds metal does not need to be extremely loud and crashing to be very heavy and Anubis Gates do a really fine job of setting the table with some really solid atmosphere here to get a heavy vibe from some great progressive elements. Mindlessness is a great example of that. This track is heavy, atmospheric and at the same time very beautiful. The songwriters are masters of their craft and this track in particular is a rather nice piece of their work. Other great moments on the CD include Hear My Call, Destined To Remember, Horizons, Breach Of Faith and Never Like This. Other than the aforementioned Airways the only other track I have issue with is the way too lengthy A Dream Within A Dream. Don't get me wrong there is some brilliant moments during that song, but at over 14 minutes long I just can not stay focused that long to really get into it. Unfortunately after that long track it sort of saps my enthusiasm a bit and the very mellow Erasure at the end leaves me a bit listless. Despite the tapering off at the end, the rest of the CD is very enjoyable and the Anubis Gate Horizon looks really good!